The shrine stands atop an ancient mound. The structure has been recently constructed – perhaps built upon an older shrine – crowned by a white dome. The dome is intricately decorated on the inside, with glass patterns and floral designs. The grave of the patron saint, Shah Bahlol Daryai, is right in the middle. There is a huge tiara above the plaque bearing his name, while turbans of the kind worn by grooms are scattered across the shrine. In Sufi symbolism, the saint is often imagined as the groom, sought by his lover and bride, the devotee. 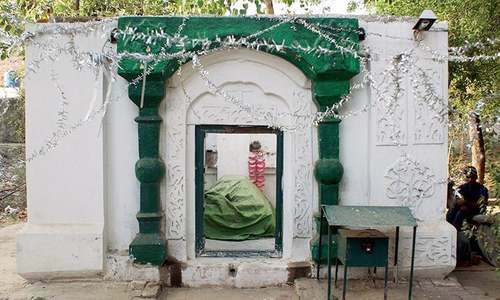 There are several graves around this shrine located near the Chenab river in Pakistan’s Punjab province, near the city of Pindi Bhattiyan. An ancient civilisation once thrived here. After it disappeared, all it left behind was a mound. For residents of the area, the ancient mound possibly symbolised death and they decided to build a graveyard on its remains – there was no contradiction in burying the dead on the top of the mound of dead. As the mound gave way to the graveyard, its secrets seem to have disappeared with it. No one can say for certain how old this mound is. Perhaps it was as old as time, merging with the antiquity of the Indus valley civilisation. Perhaps it was part of a larger network of towns or cities that contained the key to understanding the ancient civilisation. While death loomed on this ancient mound, right next to it, on an empty plain, stood symbols of eternity – three banyan trees, each one older and grander than the other. It’s hard to think of a better metaphor for permanence and immortality. With its thick trunk sinking deep into the soil, its magnificent height, and its boughs hanging from its branches that sink into the earth, in time forming new additional trunks, the tree only seems to grow older and stronger with time. Does it come as a surprise, then, that Lord Krishna recited the Bhagavad Gita under the banyan tree? Among the several magical properties ascribed to are the beliefs that the tree can bestow a couple with a child, cure leprosy and remove bad omens. According to the Atharva Veda, the banyan tree is the abode of spirits. Other ancient myths suggest that the good-natured Yakhsa spirits reside here. If the tree or even its branch is cut off, it is believed that the spirits find the house of the one who destroyed their home. There are several other myths about why the banyan should never be cut and hence several of these ancient trees are scattered across rural Punjab in Pakistan even today. One of the most popular figures associated with the banyan tree (or by various accounts, its close cousin, the peepal) is the reluctant prince who fled his kingdom and abandoned wealth and power to search for truth. It is under the shade of a banyan tree that he found this truth – where Siddhārtha Gautama became the Buddha or the enlightened one. In the process, he lent the tree its new name – Bodh, the tree of enlightenment, a name by which it is popularly referred to in Punjab. Deep in his meditation, when the demon Devaputra Mara came to distract him, it is the guardian spirit of the tree that descended for his protection. Just as death and immortality come together in this area, so too do different religions and traditions. Shah Bahlol Daryai, to whom this shrine is dedicated, was the spiritual master of one of the most unique Sufi poets of Punjab, Shah Hussain. 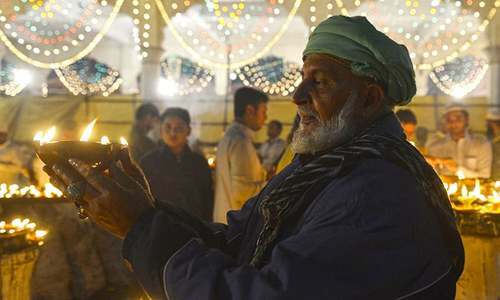 It is said that once, while he was leading a special prayer during one of the holy nights of Ramzan, Shah Hussain abandoned his position at the head of the congregation, entered the walled city of Lahore, cut off his beard and bought a set of ghungroos. Then, with a pitcher of wine in his hand, he danced in the streets of the city. In his defiance of religious puritanical movements, Shah Hussain is the ultimate symbol of the Sufi Malmati tradition of Punjab, adherents of which do not follow any conventional religious doctrine and custom, instead believing in forging a personal relationship with the divinity, usually by flaunting conventions. The Malmati tradition borrowed heavily from the Bhakti movement and the ascetic tradition developed around Shaivism. It is, in its essence, the ultimate expression of syncretic religious tradition of South Asia. During his lifetime, Shah Bahlol found solace in the company of the dead atop of the mound. Several of his devotees, and companions, including Muslims, jogis, bhaktis and even Buddhist bhikshu, would have come here to pay homage to him or visit him. The ancient banyan trees must have stood witness to those times. Banyan trees are worshiped and revered in various Sufi shrines all over the country. The boughs of these banyan trees tie together the diverse religious traditions of this ancient land. They are the last standing witness to a world that is slowly fading away. Well done Haroon Khalid. We have to acknowledge the rich traditions of our ancient land as against ideologies imported from abroad. 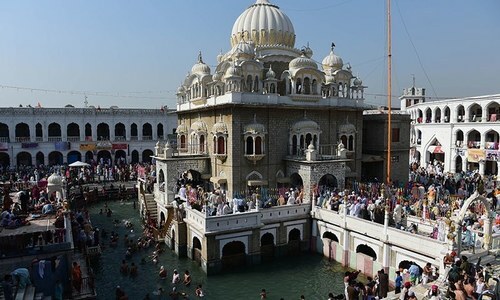 This land has produced the likes of Guru Nanak and Bulle Shah and Buddha is a product of the sub continent. There is much spirituality in original Hinduism. Thank you for this wonderful write up. We have more in common yet we choose to emphasis only our disagreements. I read the articles of Haroon Khalid with very deep interest and am thankful to him and to Dawn that the ancient cultures , their traditions and facts related to this part of country are well depicted brought to the knowledge of common readers. Once again thanks for this nice article. Excellent well researched article. Reading another article on walli Kandahar I was a big pleasure. Carry on the good work. Knowledge has no boundaries, do not enslave it. Excellent write up Haroon.. after reading your two books "In Search of Shiva" and "Walking with Nanak" it became clear to me that you have done a fabulous job by recording the rich history of spiritual and cultural heritage of the Indus Valley people.Keep up the fine work you do.. hope you are publishing these articles in non-English papers too! Hundreds of Banyan trees were cut down during Bangladesh Liberation struggle. Thank you Haroon Khalid for excellent write up. It is irony,though, that things like these need to be reminded to us every so often like a poke in our ever more numbing skin.Our parents and grand parents used to pass on such values to us hoping we would do the same.But,alas,we are failing. @Tanveer very well said but ironically the ground reality is far different!